It has always been painfully obvious that disgraced FBI deputy director Andrew McCabe didn’t resign over text-gate or “Trump and Republican criticism”. Now it all makes sense. Former Deputy Director of the Federal Bureau of Investigation, Andrew McCabe altered far left FBI investigator Peter Strzok’s notes on his interview with General Michael Flynn. And then McCabe destroyed the evidence. You know how Peter Strzok's system didn't back up. FYI: A FD-302 form is used by FBI agents to “report or summarize the interviews that they conduct” and contains information from the notes taken during the interview by the non-primary agent. It consists of information taken from the subject, rather than details about the subject themselves. The FBI cannot provide a *clean* history of revisions for the 302 interview with General Flynn. That's why Judge Emmett Sullivan, who is very tough on unethical prosecutors, had ordered the Special Counsel to disclose exculpatory evidence, which would include these revisions. It's full on freak-out mode, as no one know how to spin this. Why did a federal judge order Muller to disclose exculpatory evidence AFTER Flynn pled guilty? Do you know how unusual this is? Flynn waived the right to exculpatory evidence in his plea deal. That's because the 302 was altered, and everyone knows it. Who is Judge Emmett Sullivan? "2 Prosecutors in Case of Senator Ted Stevens Are Suspended"
Who was the judge who demanded they be investigated – which almost never happens, as federal judges are boot lickers for DOJ? Both parties did not ‘request‘ a postponement; both parties ‘agreed‘ to a postponement. The motive for the request (Mueller) is entirely divergent from, yet complimentary to, the motive to agree to the request (Flynn). This is all beginning to go backwards. It is not coincidental that Brandon L Van Grack is the signatory to the delay request by Special Counsel Robert Mueller’s request to the new Judge, Emmet G Sullivan. …. and those manipulated or falsified FBI 302’s (containing FBI investigative notes of Michael Flynn’s questioning during the January 2017 interview), were used in the actual Flynn charging documents. Well, then the underlying evidence presented to the initial judge, Ruben Contreras, in the December 1st plea hearing, were materially misrepresented. When Trump transition team lawyer Kory Langhofer (Trump for America transition organization) contacted the special counsels office about the illegal and unethical way they retrieved transition team emails from the GSA. Who was he put in contact with? 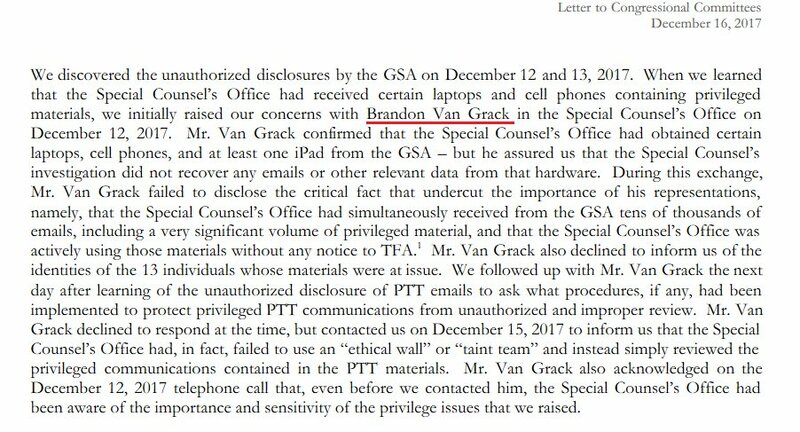 Questions: A) What reason would Van Grack have for taking the call from the transition attorney in the first place? and then, B) what reason would he have for lying about the information that was requested? It is my belief, based on mounting evidence, a specific cast of characters -within the Mueller “Russia Election Interference” probe- were placed there to protect the people behind the FBI’s 2016 counterintelligence operation against Trump. I suspect the same FBI and DOJ “small group”, the team who worked diligently to ensure Hillary Clinton was never found culpable in the 2015/2016 email investigation, later worked on the 2016 Trump counterintelligence operation (FISA wiretapping surveillance etc). That same “small group” within the FBI and DOJ were then given the task in 2017 of covering both prior operations: A) *Clear Hillary Clinton, and B) *Counterintel op on Trump. To cover, cloud and protect the DOJ and FBI officials engaged in both operations, the “small group” is now assembled within Robert Mueller’s Special Counsel team. Inside Mueller’s crew, the “small group” essentially works to watch over what information the Trump officials or congress could possibly be discovering…. under the auspices of investigating ‘Muh Russia’ etc. If the “small group” comes across a risky trail being followed, they work to impede, block, delay or deflect anyone from that trail. That’s why the Special Counsel attorney that signed General Flynn’s Statement of Offense filed Dec. 1, 2017, was the same attorney who responded to the Trump transition team inquiry. Brandon L Van Grack. This “small group” are essentially career DOJ and FBI staff lawyers behind and beside the visible names we have recently become aware of: Peter Strzok, Bruce Ohr, Lisa Page, Bill Priestap, Andrew McCabe, Sally Yates, James Baker etc. “Andrew McCabe confirmed that no FISA warrant would have been sought from the FISA Court without the Steele dossier information.” The four-page document shows senior FBI agents and Department of Justice officials used the Clinton-financed ‘Trump Dossier’ as the cornerstone of FISA court orders that allowed them to spy on “at least one” senior Trump associate in the run-up to the 2016 presidential campaign. Peter Strzok’s texts to his to his girlfriend, Lisa Page, with whom he was engaging in an extramarital affair, expose what a Trump hater he was. At the time, Lisa Page worked for Deputy Director Andrew McCabe. The pro-Clinton McCabe is also under scrutiny ……. The bottom line is that President Obama and the DNC colluded with the FBI and the DOJ to sabotage President Trump before and after the election. High treason. In order to address the absolute corruption and weaponizing of the FBI and DOJ under President Obama, Hillary Clinton and the Democrat party of treason…. New excerpts of text exchanges between FBI officials Peter Strzok and Lisa Page released Thursday appear to show the two discussing the Hillary Clinton email investigation, including how much manpower they should exert and whether or not a special prosecutor should be brought in. House Republicans are considering the issuance of subpoenas against FBI and Department of Justice officials to get to the bottom of text messages that slam President Donald Trump as an “idiot” and a “douche” and other negative things. The Justice Department on Tuesday provided five congressional committees with copies of 375 text messages exchanged between counterintelligence investigator Peter Strzrok and FBI lawyer Lisa Page. The Washington Times obtained copies of the messages, which stretch from August 2015 through December 2016.